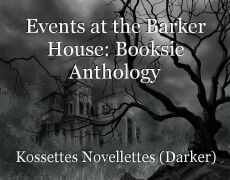 Hello everyone welcome to the Barker House Anthology a compilation of several wonderful writers who were brave enough to enter the depth of the Barker house and show what they could do when faced with twisted opportunities. I really appreciate you all making this possible and thank sincerely for joining in :) and I hope you all continue to play along with the games. Outstanding ! A perfect amuse-bouche of your words. Amazing prologue..
Whoo hoo, you know it's going to be good when a chapter starts out like this!! You described everything perfectly. From the tip of his mustache to the little domain he calls his own. I love his hotty-totty attitude, the all-importance of him and nothing else, lol. Something is brewing, and I can't wait to taste the main course! Fantastic start!